Hatirpool Bridge is located near Beriura Bazar at Sarail Upazila, Brahmanbaria on the way to Dhaka-Chittagong road. A road was built by Dewan Shabaz Ali from Sorail to Shabazpur during 1650 A.D. Many assume that this bridge was built at that time. Locally it is known as ‘Hatir Pool’. It is said that Dewans used to cross the river on back of elephant over this bridge. This brick built bridge is curved in from with one big arched opening. 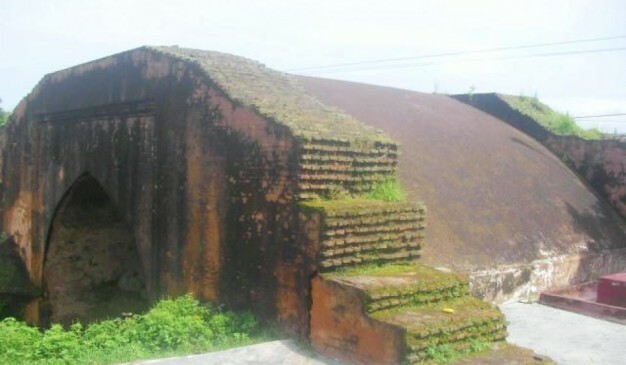 Hatir Pool is a protected monument of Department of Archaeology, Bangladesh. Both bus and train services are available from Dhaka to Brahmanbaria district. After reaching at Brahmanbaria District, to see this Mughal Bridge, take local transport to travel to Sarail Upazila at Beriura Bazar. 1. Take pictures for collection. 2. There is scope for boat rides below Hatirpool. If you are hungry you may search for nearby local restaurants. You may also carry your own food. You may visit ArphailSagardighi Mosque & Twin Graves, Arphannesa Mosque, Jami Mosque of Sarail, Hatkhola Mosque. Eliot Bridge, a glorious heritage of the district town, still attracts thousands of tourists from home and abroad. Built over the Baral in the middle of the town during the British rule, the bridge has no pillar. Popularly known as 'Boropul,' the bridge connects the eastern part of the town with its western part. The bridge stands as a witness to many important events of the this sub-continent. The western bank of the Baral was under the jurisdiction of the then Jaminder Siraj Ali Chowdhury. He realised the importance of the place and established a river port in 1808. Later, the area was named as Sirajganj after the Jaminder. In 1869, Sirajganj municipality was established and later a police station was set up. In 1866, it was upgraded to a sub-divisional town and later a district town in 1984. In the 18th century, boats and steamers were found to move through the Baral. In absence of railway, goods laden water vessels plied to Assam and other parts of West Bengal through Sirajganj. Trade and business flourished on both banks of the river. In 1892, Bitsonbell, a Briton became the sub-divisional officer (SDO) of Sirajganj. Later, he became the governor of Bengal and Assam. One day he was returning home from the western bank. All on a sudden, he heard a groaning sound of a poor man. The man bought food from his day-long earnings. As he had no single paisa, the boatman was not allowing him to get on board his boat. Observing his plight, Bitsonbell helped the man cross the river. After this event, Bell decided to build a bridge a bridge across the Baral. He formed a committee consisting of businessmen of the town. They contributed generously at its fund and the District Board granted Tk 1,500. 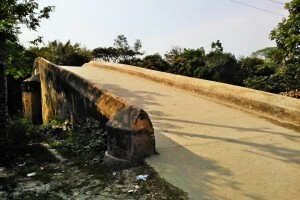 Sir Charles Eliot, the then government of Bengal and Assam laid the foundation of the 180 feet long and 16 feet wide bridge named after him on August 6. 1882. Stuart Hartland, a British firm constructed the pillarless bridge at a cost of Tk 45,000. 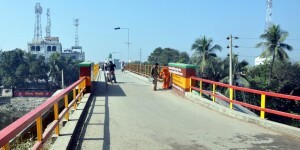 The bridge was repaired during the immediate past BNP-led alliance regime. 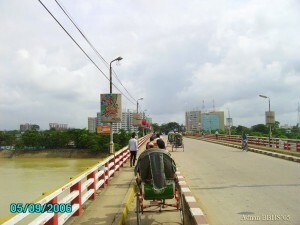 Mirkadim bridge (মীরকাদিম ব্রিজ) spans the Mir Kadim canal (creek) which runs from Mir Kadim to Tangibari. It connects the village Abdullahpur and Panam area of Rampal Union Parishad under Munshigonj District. It is situated at a distance of about 5.50 km from the district headquarters. The local tradition claims it to have been built by King Ballal Sen, but the architectural features belie the local tradition. The bridge can architecturally be attributed to the Mughal period, not earlier than 17th century. The 53m long bridge consists of a central pointed arch of 4.40m span with two side arches of 2.25m span each. The central arch is 0.40m high from the water level of the creek and at present 31m wide. It is 6.15m wide with each wing measuring 16.80m in length. The central arch is flanked by an octagonal pilaster on each side. Similarly each of the side arches has a pilaster each crowned with a cupola. The plasters of the side arches rise above the spandrel of the arch but those of the central arch are shorter and so not reach the archivolt. The pier is 1.85m thick. It is reported that on either end of the bridge there were circular pillars but now these are buried under earth. It appears that there are 6 piers on each side of the bridge. The central arch is loftier and wider than the side ones and is set in a deep rectangular panel with plain plastered spandrel. Base of the arches provided with cut waters. The hump backed bridge rises to a central point from which its back gently slopes to either side. It has a 70 cm high parapet wall on either side. The surviving thickness of the bridge measures 4.34m. It has been protected and repaired extensively by the Department of Archaeology. Lalon Shah Bridge (Bengali: লালন শাহ সেতু), also known as the Paksey Bridge, is a road bridge in Bangladesh over the river Padma, situated between Ishwardi Upazila of Pabna on the east, and Bheramara Upazila of Kushtia on the west. 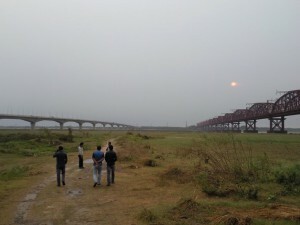 Named after early 19th century mystic poet Lalon Shah of Chhewuriya, Kushtia District, the bridge was completed in 2004. The bridge is 1,800 metres (5,900 ft) long and is the fourth longest road bridge of the country, after Jamuna Bridge, Meghna Bridge and Meghna-Gomti bridge. It provides important road connection to Mongla port of Khulna District in the south from Rajshahi division and Rangpur division, the northern part of Bangladesh. It is situated parallel to and south (downstream) of Hardinge Bridge. Shah Jalal Bridge is a bridge from where you can clearly view the Surma River.